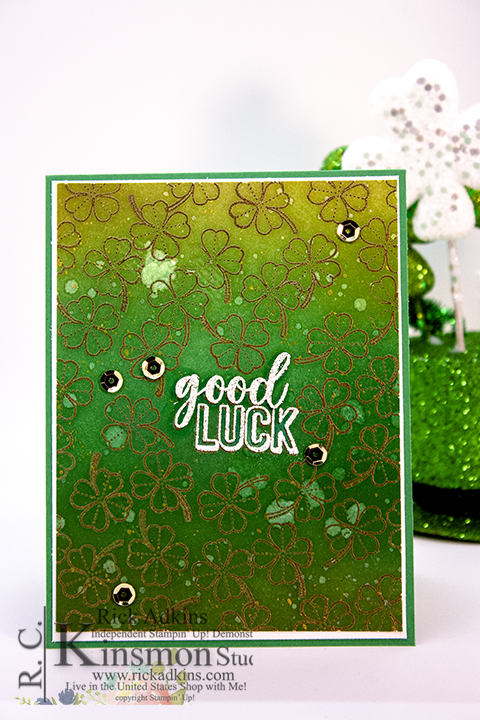 Hello and welcome to my blog; today I am sharing a card I created for St. Patrick's Day which is this Sunday. 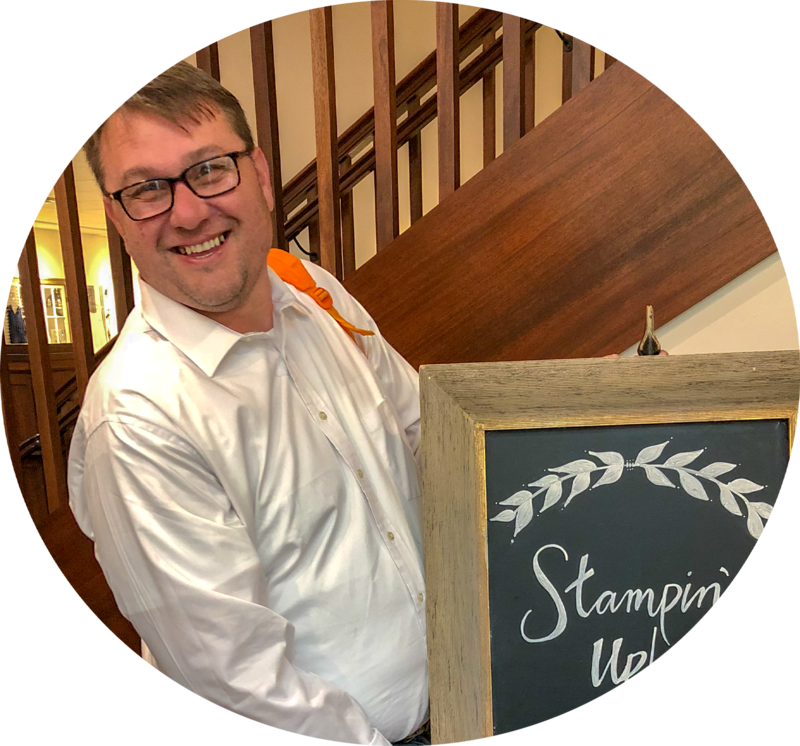 I had so much fun creating this card and I used the Amazing Life Stamp Set from the 2019 Stampin' Up! Occasions Catalog. 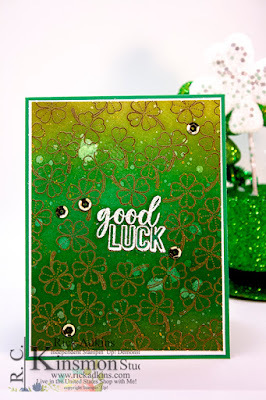 I did a little ink blending, and emboss resist to create this card. Here's a look at today's card. I mentioned in the introduction that I used the Amazing Life Stamp Set. I really wasn't kidding when I said that it was a very versatile set. I started out with a piece of whisper white cardstock and a versamark pad. I used the little four leaf clover stamp from this amazing stamp set. I stamped this image over and over the card and used some gold embossing powder over them. 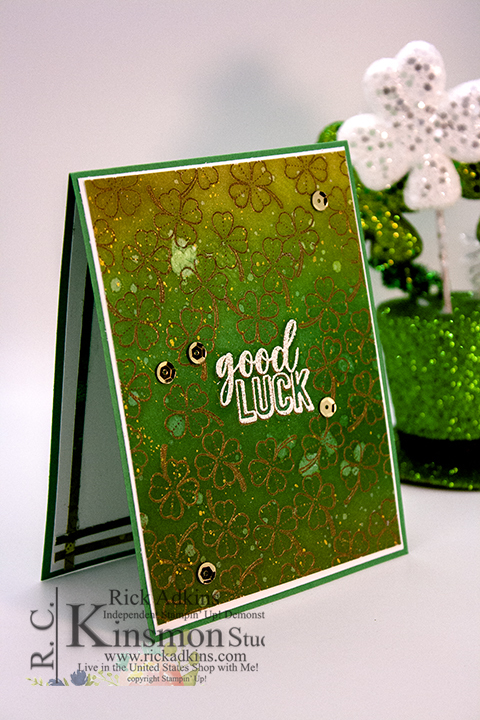 In the center of the card I inked up the sentiment that said good Luck in versamark and then used white embossing powder. After everything was heat set and cooled it was time to do a little ink blending. 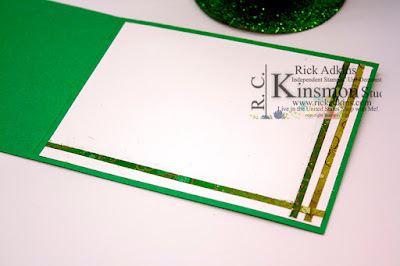 For the ink blending I used Granny Apple Green, Call Me Clover, and Garden Green inks. To blend the colors I used the makeup brushes that I shared with you last week. I started out with Granny Apple Green ink at the top. Once I had that done I added Call me Clover in the middle and then blended the two together. At the bottom I repeated the process with Garden Green and blended it into the Call me clover. 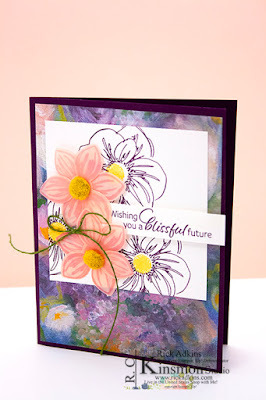 Once I had everything blended on I buffed off the ink from the embossing powder with a tissue. This removed any excess ink from the top of the embossed images. Next I flipped on a little water from my stampin' spritzer and dried it with a paper towel after if sat for just a few. I then cut down the ink blended piece to 4 x 5 1/4. I then added a white mat cut to 4 1/8 x 5 3/8. This was then attached to a Call me Clover card base that was 4 1/4 x 11 scored at 5 1/2. For the inside of the card I added a piece of whisper white (4 x 5 1/4) and add the three thin strips that I had cut off. This helped to add a little interest, as well as tied in the inside to the front. I hope that you have enjoyed my card for today. You will find all the supplies listed below in the shopping list below. Thanks for dropping bye and if this is your first time visiting welcome and I am glad that you are here. If you are a returning viewer I am so happy your back.. Make sure that you be on the look out for my second post that will come out this afternoon as part of a blog up. 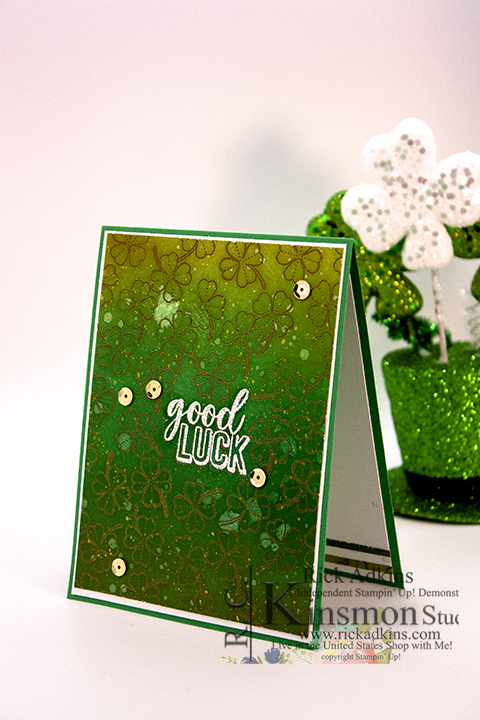 Labels: stampin' up!, crafts, cardmaking Amazing Life Stamp Set, emboss resist, four leaf clover, heat embossing, rick Adkins, St. Patrick's Day Card, Stampin' Up!